Heat oven to 375°F. Slit hot dogs to within 1/2 inch of ends; insert 1 strip of mozzarella and 1 strip of Cheddar cheese into each slit. Separate or cut dough into 4 rectangles (if using crescent rolls, press perforations to seal). Place 2 hot dogs crosswise down center of each rectangle. 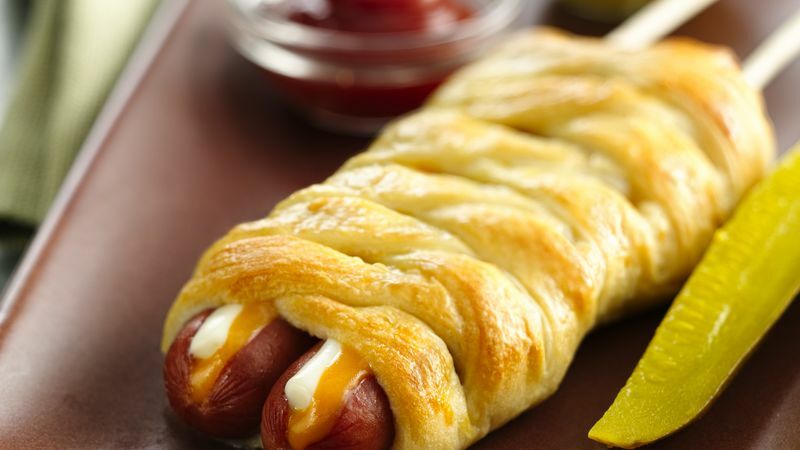 Cut 1-inch-wide strips in dough on each side of hot dogs to within 1/4 inch of hot dogs. Fold strips at an angle across hot dogs, alternating from side to side. Place on ungreased cookie sheet, cheese side up. Brush top of crescent with beaten egg. Bake 12 to 15 minutes or until golden brown. Insert 1 stick into each hot dog. Garnish with ketchup and mustard.